One day Eva Piper was an elementary school teacher, the mother of three, the beloved wife of a strong, protective husband. The next day she stood at the bedside of a broken man who could do nothing but moan in agony and turn his head away from her.Later she would learn that he had died and actually experienced heaven before being prayed back to life -- a true miracle. Don Piper's testimony, told in the New York Times bestseller 90 Minutes in Heaven, would one day bring hope to thousands. But all that was in the future. Despite family and friends who kept vigil with her, Eva Piper found herself essentially alone. Walking in the dark. And she had always hated the dark.Though it parallels that of her husband, Eva Piper's account is quite different from his. It takes listeners not to heavenly places but through a very earthly maze of hospital corridors, insurance forms, tiring commutes from home to workplace and hospital, and lonely hours of waiting and worrying. This is the story of a woman learning, step by darkened step, to go places she never thought she could go and growing into a person she never thought she could be. Packed with hard-earned wisdom about what it means to be a caregiver, to open yourself to the care of others, and to rest in God's provision, this audiobook provides a dependable source of light to help you walk through the dark. 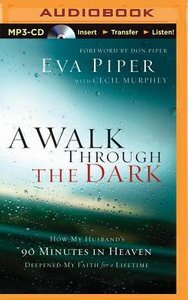 About "A Walk Through the Dark (Unabridged, Mp3)"
Eva Piper is a speaker and author with a unique insight into the trials of heartache and the triumph of overcoming. The wife of best-selling author Don Piper, Eva was the glue that held her broken husband and her family together. Don's story, recounted in the New York Times bestseller, 90 Minutes in Heaven: A True Story of Life and Death, is Eva's story too. A teacher of 34 years, she and Don now live in Pasadena, Texas. Customer Reviews For "A Walk Through the Dark (Unabridged, Mp3)"
I absolutely loved reading this book everytime I started to read this book I didn't want to put it down! Eva Piper the wife of Don Piper tells her experiences of how she survived walking in the dark while her husband wasn't even fighting to live due to depression, pain and going to Heaven. Recommended that you read 90 minutes in Heaven 1st before reading this book to properly understand it. Eva Piper is such a strong women but like everyone else she was weak and she turned to God for strength and she found her spiritual life with God became closer and stronger epecially during her darkest days. By reading this book you will see just how much God was walking with Eva from the support from family and friends, you will never be alone when you trust in God and put your faith in him. I would recomend this book to anyone! This book recounts one woman's journey, after her husband has a horrific car accident. She gives practical advice about how to offer support to those who have loved ones in hospital. Her story shows how the importance of prayer and faith in God can help you get through a difficult time.